There are numerous benefits to growing crops like fall rye or winter wheat that can drastically improve the efficiency, profitability and diversity of your operation. Many across the prairies have realized this and have begun growing these types of crops with great success. But what if you are new to growing these crops? What actions must you take to successfully grow crops that need to be seeded in September? Testing the seed you will be putting into the ground is extremely important in spring and winter crops. A poor germ, or high disease level can cripple your crop out of the gate, especially when some winter kill may be seen and plant stands can trend lower than optimal already. Test your seed and make sure you are seeding off the germination and using the thousand-kernel weight formula to hit a high plant stand. Remember, there are many diseases on the seed so be weary of diseases like fusarium on the seed as they can bring your germination and over wintering down. Soil testing is also important – properly feed your crop. 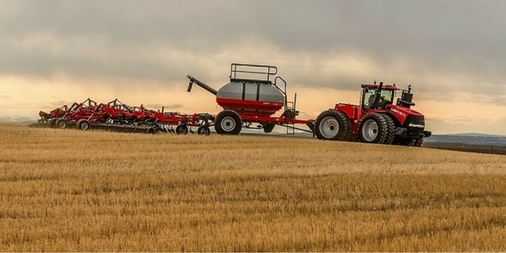 Doing this with the right products, balanced rates and in the right places across the field are the keys to getting the most out of your fall seeding. Having the discussion with your VRT provider and Agronomist about tweaking yield targets and zones based on soil tests and imagery will prove valuable as putting in a winter crop actually allows for better ability to use moisture for a longer period of time. This improves water use efficiency, which ultimately can be driven by nitrogen use efficiency. Proper fertilization has also been shown to increase winter hardiness which means a more consistent stand in the spring – less disease susceptibility, even maturity and higher yield all stem from this sometimes ill perfected component. Putting down nitrogen, phosphorous, potassium and sulphur (based on soil tests) allows that crop to not only over winter, but thrive in the spring and set a higher yield potential. Prepare yourself with nitrogen stabilizers and proper N placement to mitigate losses. The seeding dates are important for proper establishment of fall crops. Generally the 25th of August to the 15th of September are deemed ideal for seeding. These dates give the plants enough time to germinate and reach the 2-4 leaf stage of development before freeze up which increases winter hardiness and gets the crop off to a faster start in the spring. If your crops take a while to germinate due to dry conditions for example, it is good to know simply germinating is all that is required for proper vernalization of the crop. All you will see is a lesser difference between spring seeded crops and your fall seeded crops. Depth is important – Chasing moisture is not a good idea. The farther that seed has to come up out of the ground the more susceptible it is to winter kill. You want to target a 0.5”-0.75” seeding depth and ideally no deeper than an inch. A proper clean-up of weeds either before going in or after is crucial to achieve optimum stand establishment. Fall seeded crops can better compete with weeds in the spring, but they must get off to the right start in the fall. Sometimes a fall in crop application is warranted. This is determined on a field-to-field basis. Generally, anything OK on spring wheat in crop or pre burn can be used on or before winter wheat, but be sure to consult your local rep or agronomist. Getting these key components of fall seeding in line are going to get your crop off to the right start.